Anyone know this brand?? worth it? 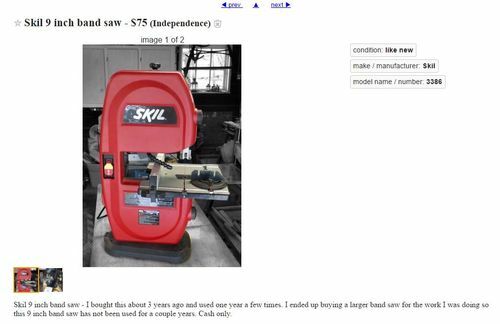 That looks just like the Cal Hawk bandsaw that I have. I paid a bit more than that and would have rather saved my money to get something better. The price is decent but don’t expect it to pass the nickel test without a good amount of work. some tuning to get it cutting straight. From my understanding, they are a knock off brand for delta, it’s cheaper made like HF, but is still supposed to be of decent quality. If its your main saw and you’re looking for high tolerances or amazing performance I’d look elsewhere, but if you’re just trimming down and aren’t resawing anything huge I think you’d have a tough time beating that price. Hell half the jamokes around me want $100 for the crappy 3 wheel 9” Delta’s or 8” Crapsman ones. I’m with Loren. Parts should be almost interchangeable. Id scoop it provided the motor ran. It’s still available. I’m going to go look at it tonight and see what I think. Open er up and make sure the wheels arent cracked or anything crazy. Outside of that theyre simple machines. Motor, 2 wheels, a belt and some bearings really. Original Buffalo brand was Buffalo Forge who made blacksmith tools and post drills and vises and such. Taiwanese folks just ‘borrowed’ the name but for $60 I’d jump on it. I had one of those . Bought new in about 82. Had it for ten years or so. Had aluminum wheels that were way out of balance but i made some corrections there. 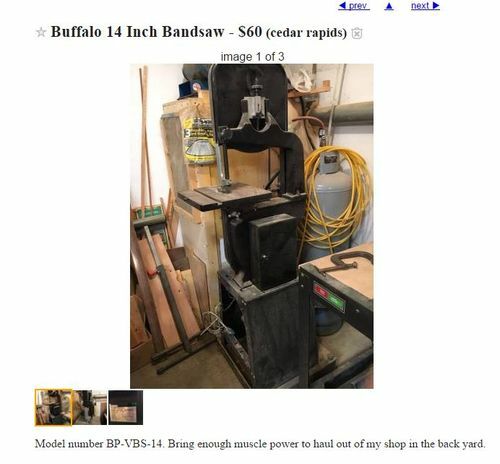 60 bucks may be ok,,,,,,i wouldn’t pay that but i guess if you don’t have a bandsaw that one may work for you if your bandsawing needs are not too demanding. Band saw needs are not demanding. Don’t use it a ton. Went and looked at it. Wheels were in good shape. Motor sounded/ran just fine. I decided to get it. For $60 it’ll be good enough to get me by until I decide to upgrade. It definitely will not pass the nickel test, so I might have to do a little tweaking to it, which could be fun. It’s cheap enough, that if I ruin it while doing some DIY work on it, it’s no big deal. Hi Doug. I had seen some Buffalo tools and they were of the same packaging and quality as Harbor Freight as I recall. Those 14 ” band saw and many of the lathes from all different brands are all made in China and probably in the same factory. They just paint ‘em different colors and sick different labels on them. I know that the Reeves drive pulleys from Harbor Freight fit a Jet and a CA900 lathe from Australia. I have used them on both! !